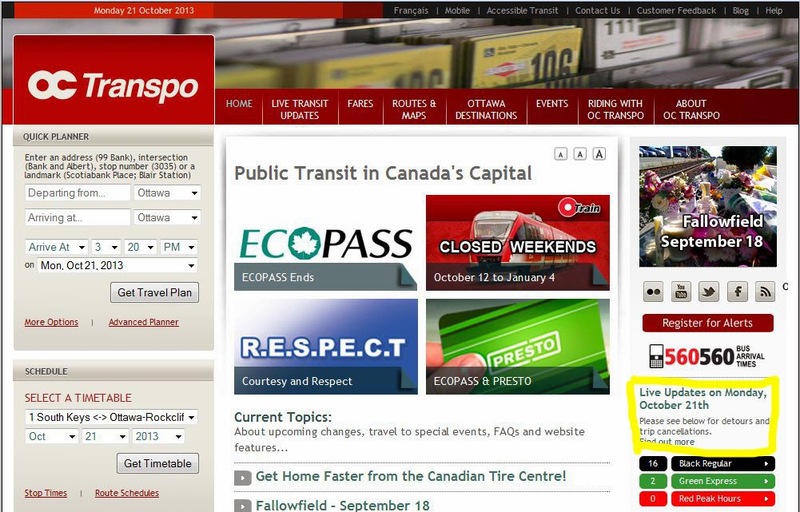 Early this week you will see a few changes to the octranspo.com homepage. • A new “breaking news” panel will be available at the top of the page. • Daily service status messages will also be prominently displayed at the top, in the centre. • There will be more room to include images with each news item. • All news items will be organized in one central column, instead of two columns. • Upcoming events will be displayed on the right-hand column, one click away from the Quick Planner. 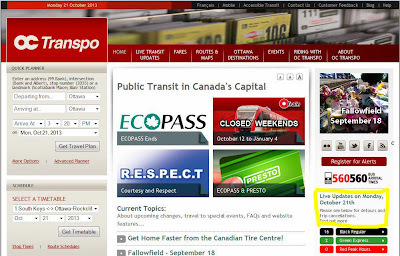 The OC Transpo website is very popular – it receives 15-20,000 visits each day. We didn’t want to tinker too much with success, but based on previous suggestions felt that these changes would be an improvement. Please let us know what you think – send your comments or ideas to ocadmin@octranspo.com. A little thing like displaying important messages about service delays in a prominent spot on the website can significantly improve customer experience. As you may know, during any unexpected partial Transitway or O-Train closure, you'll usually see a message tucked away on the side in the smallest font size, which is how they are displayed right now. It's something we can easily miss on the home page. These changes refer to their main website only, but the mobile website deserves similar treatment too. Any important service updates should be on the main page of the mobile site without making the user click on another page to see if, for example, the transit system is an hour behind during a snowstorm.